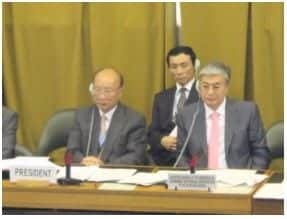 North Korean ambassador So Sepyong (left) presiding over the Conference on Disarmament (CD), Geneva, August 4, 2011. Next to him is Kassym-Jomart Tokayev (right), Director-General of the UN’s European Headquarters who serves as Secretary-General of the Conference on Disarmament. More photos from today. Protest this week in front of UN Geneva headquarters, featuring UN Watch director Hillel Neuer and North Korean defector Kim Joo-il, August 2, 2011. Click here for YouTube; click here for photos. Canada is boycotting the conference until North Korea’s presidency expires in September. Former North Korean army captain Kim Joo-il, a defector now living in Britain, told a Geneva press conference organized by UN Watch this week that the regime is using its presidency “as propaganda for manipulating its residents,” to “perpetuate idolatry” of dictator Kim Jong-il and the “slavery” of North Koreans. “Even if the presidency of North Korea of the Conference on Disarmament remains only for one hour — not even a week or a month — it is symbolic. The support of the international community is going to push North Korean residents even more into the hell that they are already living in right now,” he said.